Prime Minister Narendra Modi on 4 December launched a scathing attack on the Congress for indulging in divisive politics in view of the ensuing Gujarat Assembly elections and said the party learnt divide and rule policy from the British. 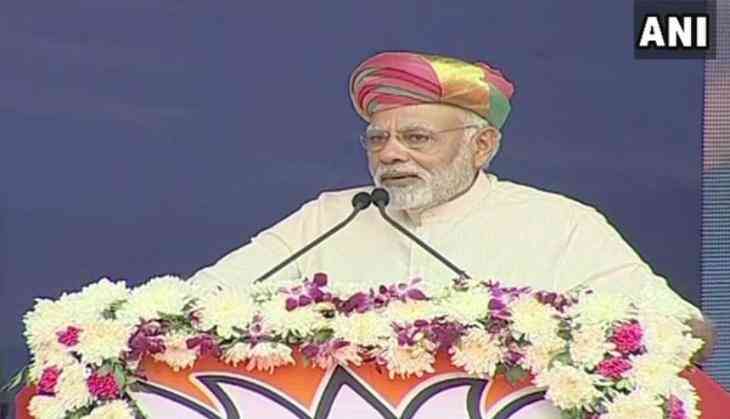 Addressing a rally here, the Prime Minister said: "I fail to understand why the Congress is once again doing what it always did in the past- divide people, be it on caste lines, communal lines, between villages and cities. Congress has learnt 'divide and rule' from our colonial rulers (the British) rather well." He further added that Gujarat has grown due to the power of Shanti (peace), Ekta (unity) and Sadbhavana (integrity) and the people do not want the type of Gujarat that the Congress is trying for. "I am seeing videos of Congress supporters saying, vote for Congress on 9th and 14th and then we will do 'Dadagiri' for 5 years. This is not the Gujarat that the people desire," Prime Minister Modi said. He also accused the Congress of making 'fake promises' just to win the upcoming assembly elections. "I appeal to the Congress to stick to the truth. The people of Gujarat do not like poll time lollipops and false promises of the Congress," said Prime Minister Modi. He also said the people of Uttar Pradesh have rejected the Congress time and again because they know the reality of the grand old party and its leaders. "The people of Uttar Pradesh know the Congress and their leadership well. And see how they have rejected Congress repeatedly," he said. After winning the UP assembly elections with absolute majority, the Bharatiya Janata Party (BJP) has also performed very well in the recently held civic polls. Earlier addressing a rally in Dharampur, Prime Minister Modi took another jibe at the 'dynastic politics' of the Congress Party by dubbing the party's Vice-President Rahul Gandhi's expected 'elevation' as an "Aurangzeb Raj". "I congratulate the Congress on their Aurangzeb Raj. For us, the well-being of the people matters and 125 crore Indians are our high command," the Prime Minister said addressing a rally here. The jibe comes following the nomination by Rahul for the Congress' presidential election earlier in the day. The post is currently held by Rahul's mother Sonia Gandhi who has been at the helm since 1998.